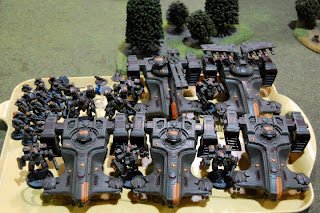 There are 7 Tau armies at the Grand Tournament. Quite an unusually high number it has to be said. But the interesting thing was how they were all completely different from my own Tau army. Unfortunately, I wasn't able to get photographs of them all or learn their compositions, but there were some general trends that I spotted regarding troops, elites and heavy support choices. Perhaps we need a new Codex sooner than I had thought? Here is the run down of what I saw. Yes, this is my army. I had to include it for completeness. I'd gone for a combination of mechanised with Battlesuits. 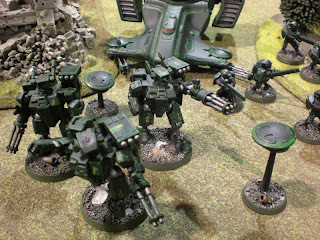 Mostly so my Battlesuits had some large tanks to hide behind. 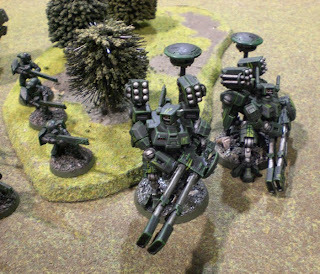 My main tactic was the Tau Tank Wall, which swings round the flank, firing as it goes, with the Battlesuits doing Jump-Shoot-Jump over and behind it. I finished 56th. This was a really nice looking army. Shame to see it so far down the tables, but it seemed to be designed for 4th edition rather than 5th edition. While it had plenty of Broadsides the 2nd Battlesuit team only had burst cannons. I've tried this unit myself with unhappy results. Loved the guys broadside conversions. I didn't get a good look at this army. But this was also quite far down the tables. Also seemed a throw back to 4th edition. I think it was this guy who managed to qualify for the final. Minimal troops, but plenty of railguns and his Battlesuits were armed with both fusion blaster and plasma rifle. I think he had 2 of these units and another unit with twin linked missile pods. He certainly suffered in the objective based missions but when it came to killing things, his 3 Battlesuit units would be able to deepstrike into enemy territory, take out tanks, monstrous creatures and heavily armoured targets with relative ease while the 5 railguns pounded targets from afar. Maybe its just my troops who die easily? At first glance this guys army was near the same as the Brown Tau, but he didn't do nearly as well. Then again, he did give his Tau Commander the Airbursting Fragmentation Projector. I didn't get a good look at this army, but from what I could see it was mostly mechanised with 3 Hammerheads for heavy support. It ended up quite far down the tables. This was my friend Luke's army. Not sure where he came in the tournament, although I know he didn't do great. Lost out on objective missions and generally got blasted apart for his troubles. Stealth suits were useless! With the Brown Tau qualifying and my own force falling short of going through to the final (not that I wanted to), I think it demonstrates what kind of Tau army works well in 5th edition. In fact, the Brown Tau seem downright nasty. The Kroot can go hide in some woods to claim an objective (and go to ground). The Firewarriors can get in the Pathfinder's Devilfish which in turn allows the Deepstriking Battlesuits to reroll their scatter. The Pathfinders light up targets for the Broadsides (and Battlesuits). Then the railguns, plasma rifles, fusion blasters and missile pods annihilate that unit and move on to the next one. The army is screwed when it comes to multiple objectives, but if it can kill everything, then who cares? As for my army, I think sneakiness may have won out over brute force. My army isn't nearly as hard hitting, but it floats around, using the Tau Tank Wall to protect my troops and Battlesuits while dealing out minor damage here and there. But as you will find when I post my battle reports from the Grand Tournament, it doens't have that punch to clear someone off an objective. Stay tuned for Warhammer 40K Throne of Skull Grand Tournament battle reports soon! How does this tank wall work? I thought You don't get a cover save behind skimmers. I also don't understand how can your suits jump-shoot-jump. I thought they can only move(on feet)-shoot-jump. Basically in the last edition you could shoot under skimmers making it difficult to hide behind them, in 5th edition they block LOS as normal, meaning you can hide behind them quite easily. Basttlesuits are jump suits so can jump in the movement phase 6", then in the assault phase can jump another 6", the latter HAS to be a jump move, the former can either be a jump or a walk. Aww so close to qualifying! I was looking forward to seeing your army at the final too, assuming I qualify that is! Looking forward to the battle reports! Gah whats wrong with an Airbursting Projector? That thing is good for a lot of wounds. Thanks for the help Dezartfox! So if I put my suits behind HHs for example, they will get a 4+ cover for being obscured? All those tau armies, and not an Ethereal in sight!!! Not to mention that you all seem to have roughly the same units, with a little variation to weapon choices. Just goes to show that the Tau army really needs to be updated and improved. 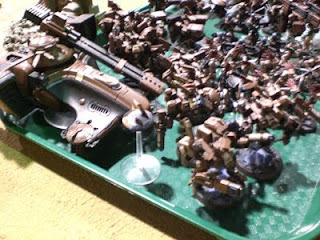 That is a large chunk of the Tau army that is discarded when it comes down to gaming! GW sort it out!!! Adam, though you may knock your own fire power i think that your strategy is sound! and offers a variant style of play for your opponents rather than the same old "Tau strategy"
Yeah, I too have drifted from the skirting tank wall and more to the hiding kroot + lots of guns and markerlights route. But for me the tank wall just gets swamped by some of the armies I play at my store... Orks in particular. Adam, this is really interesting thanks for the run-down on the Tau Armies. It's curious how similar they all are. No ethereals, no surprise. Huge liability. I'm surprised to see no Piranhas. Add in the +BS upgrade, disruption pod, and Fusion Blaster, and it's a bloody disgusting little boggart to deal with, especially in pairs. It's great for blocking movement, and being a general threat. Past that...Amen on the tau lack of options. Fire Warriors, because I have to. Hammerheads w/ Railguns, and Broadsides w/ Advanced Stab. Sys. I mean, it can be very, very nasty and balanced, but there just really isn't much for options. In a sense, it makes it easier to build an army, but it kills the hell out of our variety. Maybe GW will actually DO A FREAKING NON-MARINE-CODEX after Tyranids, who need it more than we do. At least we can SHOOT THINGS. I really find, of all those Tau lists, that yours is the most viable. My list, even before I started reading your blog, was very similar to yours. So many Tau units feel so useless to me. When I'm unwilling to take about 60% of my unit types I really think that its time to get a codex update. Many people think Tau are still fine in 5th, but the fact of the matter is we work damn hard to still be competitive, yet compared to other lists its very hard to keep up. P.S. GW, please give me the option to put Ion Cannons on my Broadsides. As much as I want a new codex, there is part of me that loves the one we've got now. Where else can you get a 5-point disruption pod, an AV11 speeder or flechette dischargers? Adam, didn't you sell your Tau army to some guy from Spain? Yes and it ships out today! I am building ANOTHER Tau army with magnetised weapons instead. Please keep us updated! I can't wait to see how you paint your new army FAST. I'm really interested. Yeah magnets are definetly the way to go. I'm starting y tau army with magnetised weapons. Probably take a little longer though worth it in the long run I imagine. Just got to be careful not to lose them. I wanted to do the same with my crisis battlesuits. I was going to buy a couple packs of the rapid insertion teams but they no longer sell them. infact you can't even buy a box of three battlesuits, which is disgusting seeing as in a full organisation chart you can have up to 15 crisis suits; planet-strike you can have about 27 (plus more with farsight) and an endless amount in Apocalyps. yet you can only get crisis suit individually. This is just plain wrong! 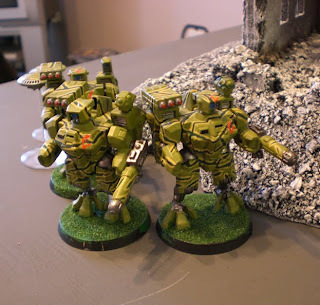 FYI those Dark Green Tau with the converted Broadsides are Mike from Flame On's. I agree that his choice of Crisis Suit load out is odd but it did do well for him at TS this year hence running it again at the GT. Now the real question is when are you getting you're batreps up dude? I finished writing them last night. They're scheduled for Friday and Saturday. Friday and Saturday! That's rubbish! I am away at Gus's and OW all weekend! What am i going to entertain myself reading? Adam, are you currently focusing on your space wolf army? or will you be starting your new tau army sooner than we're hoping! we all love this blog so I hope you dont leave us hanging! I've only painted 1 space wolf model! just thought id drop you guys a list i used at an escalation style tourney. i came 17th out of 30 i think it was. this is in 500pt blocks.